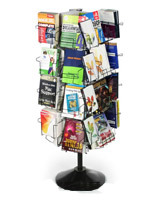 How can these literature racks promote wares and services for business? 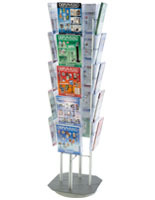 When it comes to portable trade show accessories or permanent store fixtures, this collection of magazine mounts is the best way to steer customers toward company take-aways. 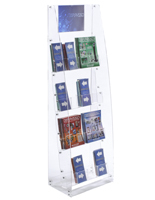 These literature racks, also known as display cases for periodicals, reveal titles to prospective clients while keeping paperwork secure and organized. 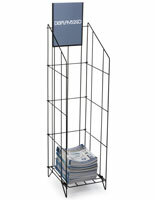 Choose from single pocket or tier design to multiple depending on the type of pamphlets being stored. 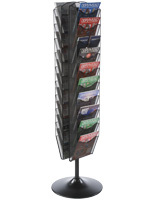 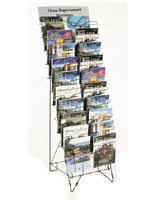 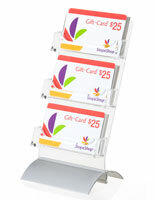 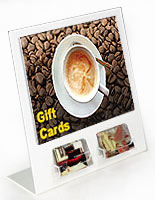 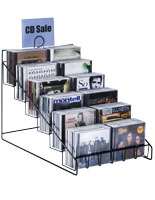 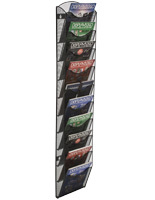 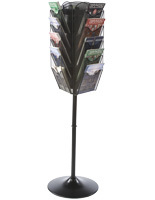 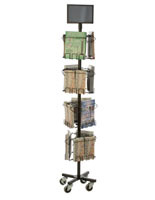 Each of these literature racks, also known as brochure holders, is a well designed sorting system for retail. 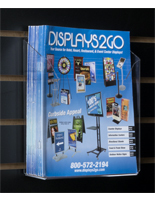 These trade show accessories are counter, floor, or wall mount style. 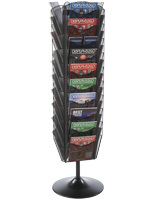 Each of these literature racks that are office organizers sort pamphlets and catalogs that sell your company. 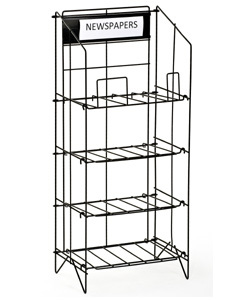 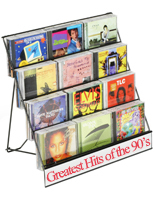 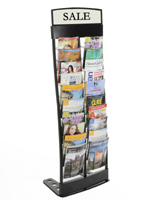 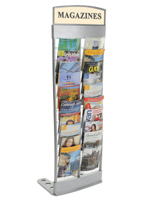 These magazine displays are available in cardboard at cheaper rates, and many items feature adjustable shelving and pockets for varied sizes of material. 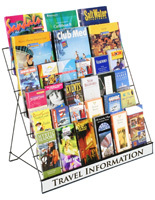 What types of periodical cases are found on this website? 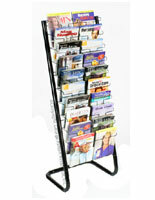 Floor-standing literature racks showcase a large group of periodicals while freeing up counter space. 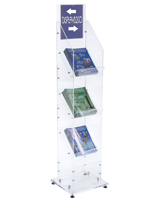 Tabletop units keep floor space clear for foot traffic, and are likely to get noticed beside a register. 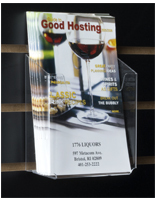 Wall mount fixtures save counter AND floor space and can be conveniently hung in high-traffic areas. 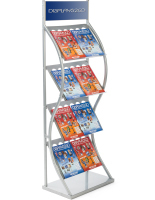 Whether single or multi-tiered, one or 10 pockets, rotating or stationary, mobile or fixed, these solutions for dispensing reading material are versatile! 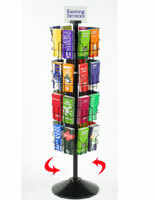 These stands come single-level or mult-tiered, depending on how much space you have, and how many items need dispensing. 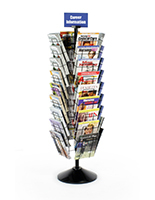 Clear display cases enable immediate viewing of titles so nothing gets missed. 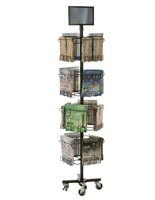 Rotating plastic and wire sorters can be maneuvered by busy customers with little effort. 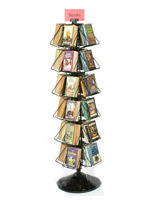 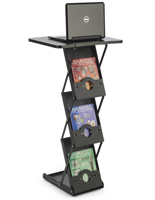 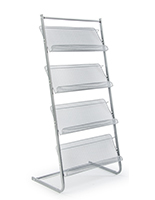 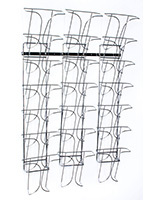 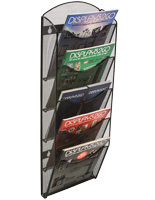 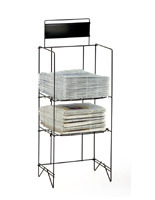 Purchase one literature organizer, racks system - or 100 at bulk prices for huge savings! 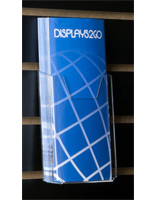 What materials are these displays constructed out of? 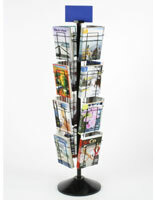 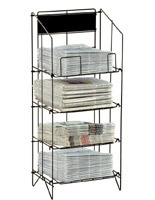 Wire: Optional sign holders at the top make these multi-level structures great newspaper holders. 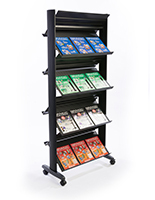 Wood: Popular with teachers and librarians, Baltic birch units have removable shelving and optional casters; some have slots for power cord access. 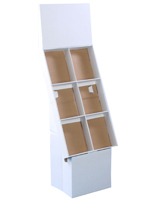 Cardboard: This lightweight offering ships flat to save on costs, and can be folded down and stored until the next trade show or event. 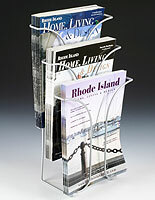 Acrylic: With adjustable pockets with peg dividers, these clear options store catalogs right alongside trifolds if user desires. 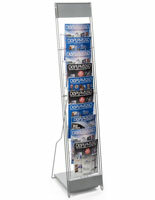 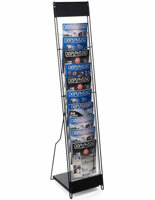 Professionals place brochure holders in waiting or reception areas and conference rooms to keep visitors occupied. 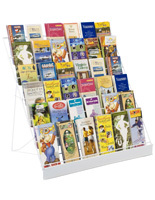 Teachers, librarians, and childcare givers love wooden racks with adjustable shelving for books. 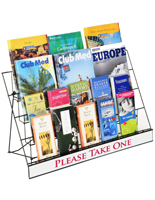 Hotels and hospitals supply information in high-traffic greeting areas and lobbies. 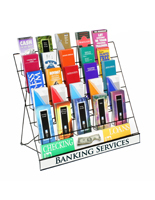 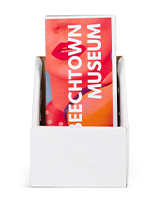 Lightweight, portable cardboard or wire displays promote services at a convention. 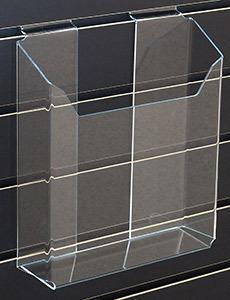 Real estate brokers and travel agents enjoy acrylic wall units for shop and showroom. 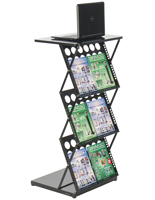 Professional venues are conducive to space-saving tiered, rotating shelf units. 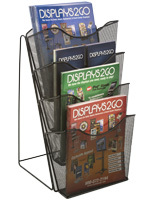 In addition to these trade show supplies, this website offers the most complete selection of countertop, floor standing, or wall mount newspaper and magazine displays and brochure holders available! 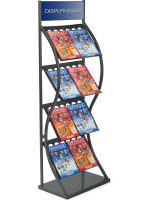 Shop the #1 POS displays resource in America for racks or inquire via live chat from Monday through Friday, 9 a.m. to 5 p.m. EST (call before 2 p.m. for same-day ship on in-stock items!) 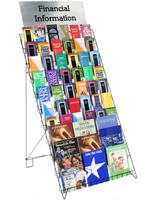 Our literature organizer line is diverse and our warehouse is jam-packed!